Perhaps the most important issue in designing a hierarchical taxonomy is creating hierarchical relationships between terms correctly. This makes the taxonomy intuitively easy to understand and navigate by all kinds of users, regardless of whether they have had any training on using a taxonomy. a broader term which is a whole entity and a narrower term which is an integral part. It is the first, generic-specific type that is most common, but is also most prone to errors by those not experienced in creating taxonomies. Typical errors include confusing refinement and narrower terms, too closely reflecting the source content hierarchy, and creating narrower terms that are applications, uses, or examples of a broader term. We envision users browsing a hierarchical taxonomy from top down, from broad topic to more specific topic. A more specific topic is a narrower term (NT) of a broader topic. However, instead of providing more specific topics, the creator of a taxonomy might mistakenly provide refinements of the broader topic, which are aspects of the topic, but not actually narrower terms. A term that is an aspect or refinement is not a unique stand-alone term/concept, but rather it is meant to be used in combination with its parent term. In this case, the duplicate narrower term should be changed to be specific in each case, such as: Objections to evidence waiver and Right to jury trial waiver. Novice taxonomists might create such incorrect broader term-narrower term relationships because they have seen them formed as such elsewhere, such as Library of Congress Subject Headings plus Subdivisions or back-of-the-book index main entries plus subentries. A subheading or a subentry is not the same as a narrower term, because a subheading or a subentry only has usage and meaning in the context of the main heading it is associated with (appears under). A taxonomy narrower term, on the other hand, is not a different kind of term, but is rather a description of a relationship between terms. 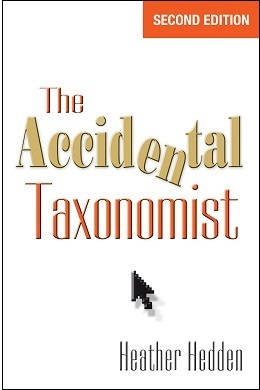 The meaning of a term in a taxonomy is constant and not dependent on its location in the taxonomy. Some taxonomies are based heavily on certain text sources, such as the table of contents of one or a limited number of books or manuals, where the text is structured into units, chapters, main heading sections, subheading sections, etc. It is thus natural to make use of the structure of the text as a basis for the structure of the hierarchy. But there can be issues. In the following example of a chapter and its headings from a textbook, greater hierarchical structure is needed for the corresponding taxonomy terms, and one of the topics (Units of Measure) does not belong within this hierarchy. The only correct narrower term above is Antiglaucoma Agents, as the other terms are not specific to eye medications. They could be linked as related terms instead. Relying too much on certain text sources for the taxonomy may also result in erroneously creating narrower terms for the applications, uses, or examples of the broader term concept, because the text presents content that way. 2) the narrower terms should be modified and clarified, such as Cultural challenges to globalization, Economic risk challenges to globalization, Political challenges to globalization, and Managerial challenges to globalization. This would be the case, if these terms did not exist elsewhere in the taxonomy. In conclusion, hierarchical relationships need to be constructed independent of any sources for terms, and they need to be universal and not subject to certain contexts. These are hierarchies, but they are not topical hierarchies. Canada is an instance of Country, British Columbia is an instance of StateProvince. Yet British Columbia has a partOf relationship, to Canada, which is distinct from the Broader Term relationship of StateProvince to Country. I haven't noticed this problem as much, but you bring up a good point, Kurt. While the standards specify that a hierarchical relationship may be either of the generic, instance, or whole-part types, the standards do fully explain when it is acceptable and when it is not to mix the hierarchical relationship types for the same term. Doing so, such as for geographical place, is thus not a violation of current standards, but rather goes against best practices. It's not recommended. In re-reading the ANSI/NISO Z39.19 standard now, I see it gives the example of Bones NT Skull (generic/class type of hierarchical relationship), and Head NT Skull (whole-part type of hierarchical relationship), and it says "In some cases, polyhierarchical links can be based on logically different relationships." In my opinion, what is missing from the standards is something saying: The polyhierarchical link based on logically different relationships is OK with the combination of the generic and the whole-part types of hierarchical relationships, but polyhierarchical links should not be based on logically different relationships with the combination of the instance and the whole-part types of hierarchical relationships. This would be the example, of Canada NT British Columbia and States/Provinces NT British Columbia, within the same taxonomy. Excellent article, Heather! This is absolutely one of the first errors students make when learning to create hierarchical taxonomies, and likely because we are so used to organizing various aspects of information in TOCs, vs. creating the specific types of relationships as defined in the standards. Thank you for clarifying not only what the issues are, but also how to rectify them. There's always more to learn!